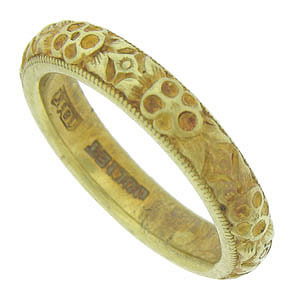 Deeply engraved pansies and leaves burst from the surface of this rich yellow gold wedding band. Strings of delicate milgrain decoration frost the edges of the romantic wedding ring. 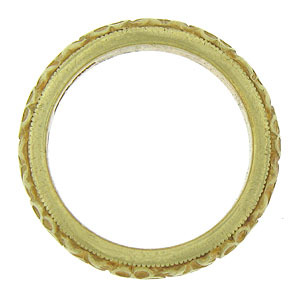 Fashioned of 18K yellow gold, the vintage ring measures 3.35 mm in width. Circa: 1940. Size 3 1/4. We cannot re-size.